It’s not very often in professional sports where a team that looked so dominant will degrade into an on-court/field/ice mess in a little as ten weeks (Or 3 weeks). Remember the 2011 Boston Red Sox? They were destined for a postseason run that could have them playing into late October. What happened? Well if you’re a Red Sox Fan and did your best to expunge this memory from existence… I’m sorry, but the show must go on. 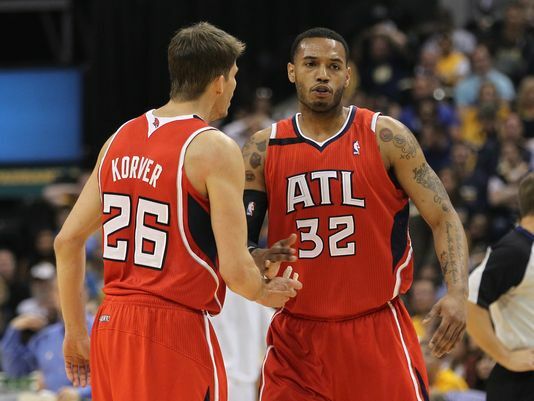 Hawks Forward Mike Scott caught fire in the 2nd quarter going 5/5 from 3 point land. After beating the Texas Rangers on Sept 3, 2011 the Red Sox took a 9 game lead over the 3rd place Tampa Bay Rays. Over the next 23 games, however, Boston pulled the granddaddy of all chokes and allowed the Rays to tie them in the standings. In fitting fashion, the Sox lost a 3 game series against a 70 win Orioles team, and missed the playoffs entirely. Unless you’ve been living under a rock, you know why I’m making this comparison. The Indiana Pacers went from NBA darling, Heat killer, up and comer, whatever you want to call them; to first round dud. Last night, as I predicted, the boys in Indy couldn’t handle what the Hawks were cooking en route to being down by 30 and losing at home once again. But wait! They cut the lead to 10 and had a chance to win! They must have figured something out, right? The Hawks were up by 30 points and played not to lose. It happens. Hilarity ensued (at least from my couch) and the Hawks surged to a 61-40 lead at the half. It got as bad as 80-50 midway through the 3rd until the Pacers decided it was time to put forth effort. It turned out to be too little too late, and now the Pacers find themselves in a 2-3 hole before heading back to Atlanta. If the Hawks can pull off the imaginable on Thursday, this may very well be the worst collapse in NBA history. Thank you Indiana for an incredible season! These made up Pacer headlines can help put things in perspective. The End Goal? Pacers Stress Importance of #1 Seed. Torrid Start! Pacers in Midst of Best Start in Franchise History. MISSING: Roy Hibbert. Search Party for Big Man Begins. Phew! Pacers Nearly Lose 1 Seed to a Team Clearly Coasting Through the Regular Season With 70% Effort. Is it over? Pacers Manhandled by Sub-.500 Team on Their Home Court – Multiple Times. Home cookin’ just ain’t the same during these NBA Playoffs. Road teams are now 19-14 through 33 games in the first round. With the exception of the Heat-Bobcats series, just about all the series in Round 1 have defied conventional wisdom. All high seeds have found themselves behind at one point or another in their respective series, and the low seeds are playing with high confidence. 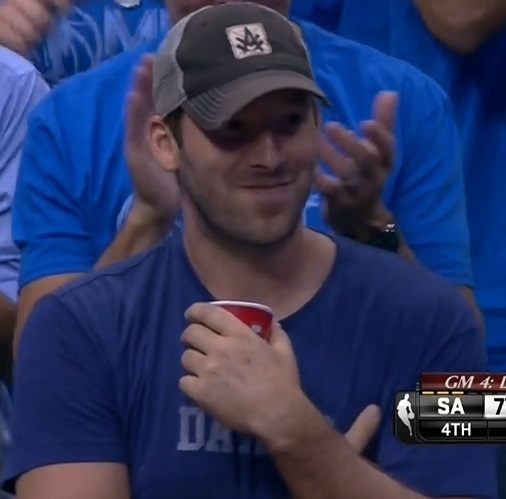 Cowboys QB Tony Romo attends Game 4 of Spurs/Mavs in Dallas. No interceptions were thrown. The Heat apparently swept the FutureHornets last night. If nobody witnessed it, did it really happen? Meanwhile, the Mavs let another late lead slip away and let the Spurs escape with a 93-89 victory in Dallas. This was to be expected because the #RomoCurse was in full effect last night. Ahh yes, Romo never fails to disappoint. WIZ/BULLS – Can the sorceres from Washington finish off the offensively inept Bulls tonight? Chicago wins game 5 by effort alone, and probably a triple double from Noah. GRIZZ/THUNDER – I don’t even know anymore. If the game goes to OT, Grizz win. If Durant and Westbrook have another terrible game, Thunder win. This series goes against all conventional wisdom. CLIPS/DUBS – Protests galore. Fans may win just because Sterling won’t attend. Another toss up only because it all depends on how the Warriors play.